Hungarian oculist and ophthalmological writer, born at Köpcsény (= Kitsee), near Presburg, Jan. 1, 1849. He studied medicine at Vienna, Berlin, Prague, and Heidelberg, graduating (M.D.) at Vienna Dec. 25, 1871. 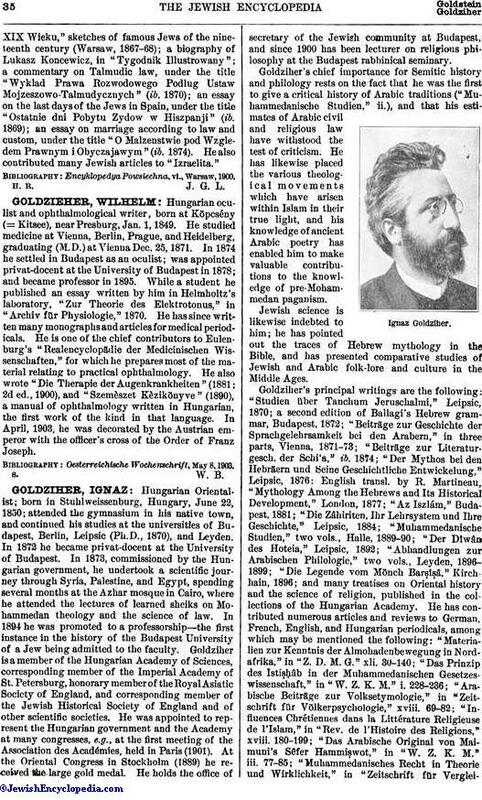 In 1874 he settled in Budapest as an oculist; was appointed privat-docent at the University of Budapest in 1878; and became professor in 1895. While a student he published an essay written by him in Helmholtz's laboratory, "Zur Theorie des Elektrotonus," in "Archiv für Physiologie," 1870. He has since written many monographs and articles for medical periodicals. He is one of the chief contributors to Eulenburg's "Realencyclopädie der Medicinischen Wissenschaften," for which he prepares most of the material relating to practical ophthalmology. He also wrote "Die Therapie der Augenkrankheiten" (1881; 2d ed., 1900), and "Szemèszet Kèzikönyve" (1890), a manual of ophthalmology written in Hungarian, the first work of the kind in that language. In April, 1903, he was decorated by the Austrian emperor with the officer's cross of the Order of Franz Joseph. Oesterreichische Wochenschrift, May 8. 1903.